The Washington Post food critic is on the go, eating out as many as a dozen meals a week—and never under his own name, the better to dine under the radar. Tom Sietsema writes a weekly restaurant review for the Sunday Magazine, pens a preview of a new place for the Wednesday food section, hosts a live, online dining chat every Wednesday, and produces both a spring and fall dining guide. He won the prestigious James Beard Award in 2016 for his series exploring "10 Best Food Cities in America.” In addition, he writes periodic features, in which he has gone under-cover as a dishwasher, ranked the nation’s leading chains, lost seven pounds on Weight Watchers while still critiquing restaurants, and ranted about everything from tight tables to the Michelin Guide. 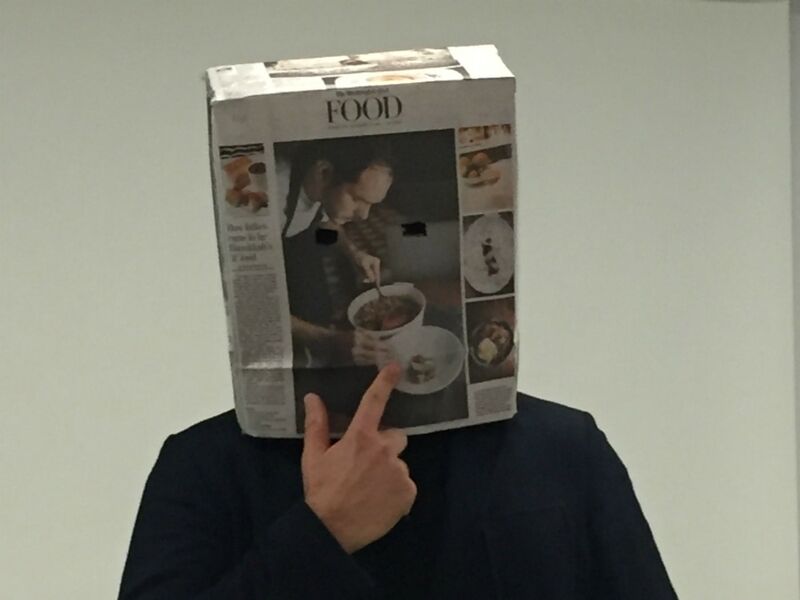 Washington Post food critic Tom Sietsema wears a cereal box laden with food photos to disguise himself. So who better to ask for a restaurant recommendation than Sietsema? The critic shared his favorite restaurants with us, a mix of old and new eats in the Washington, D.C. metropolitan area. "What I appreciate so much about this recent import from the owners of Vedge and V St. restaurants in Philadelphia is the utter absence of preachiness. The chefs quietly go about serving terrific plant-based food that reminds diners they eat first with their eyes. And the cocktails rock." "Here’s where you’ll find me on a rare night when I’m not reviewing, grazing on cornmeal-crusted oysters, a stellar burger and homey chocolate cake: simple American food prepared exceptionally well. Buck’s also has the best communal table in town, and honeyed lighting that makes everyone look better than before they stepped inside." "It’s as if a group of some of Washington’s best chefs, bakers, bartenders and servers got together and said, 'Let’s put on a show!' Utterly unpretentious, across-the-board delicious, Elle resides in the former Heller’s Bakery in Adams Morgan. I love that the owners kept the bakery’s sign and only light four letters: E-L-L-E. Not to be missed: spicy apple salad and spaetzle with clams." "My favorite journey is to India. Between visits, I have this modern Indian restaurant to sate me. My idea of a perfect meal is sweet potato peanut curry and chicken kebab, fired up with green chilies, in the splendor of a booth shaped like a carriage and hugging the window. #thankyouchefvikramsunderam"
"No restaurant tries harder to please its clientele than this fabled dining destination near the Blue Ridge mountains. As much as I admire Patrick O’Connell’s whimsical food—'tins of sin' paved with caviar and crab and exquisite sorbets staged on a painter’s palette—I love the over-the-top theater in and around the property, from the cheese cart that arrives atop a little cow on wheels that moos to a chandelier in the chicken coop. And to think it’s celebrating 40 years!"